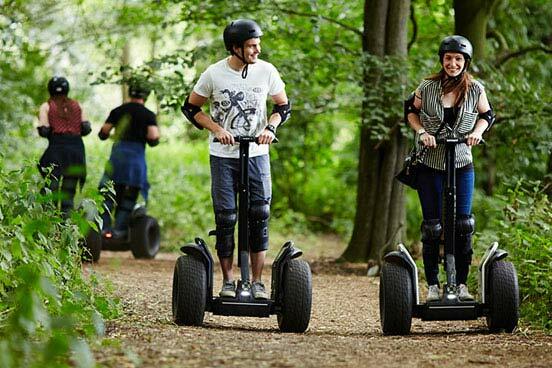 Enjoy the adrenaline buzz racing Segways around a purpose-built rally course with this Segway Thrill for Two experience. Segways are an exciting mode of transport, they are a self-balancing device, keeping riders upright at all times and are easy to operate. Riders lean their bodyweight in the direction they wish to travel and the futuristic two-wheeled vehicle responds accordingly. The experience begins with a quick registration process and then riders are kitted out in appropriate safety equipment, including a helmet, plus elbow and knee pads. An instructor-led training session allows individuals to get to grips with the basics of how to manoeuvre their favourite new vehicles. Then, with full confidence gained, it’s time to put those new-found Segway skills to the test and take to the track. Riders will enjoy all the twists, turns and various terrains of the rally track while reaching speeds of up to 12.5mph. Your pulse is sure to be racing as you compete for the fastest time. All participants receive a souvenir certificate to remind them of their unique and thrilling experience. This experience is for two people, you will be in a group with up to 12 other people. There is no minimum age, although under 16's must be accompanied by a paying adult. The minimum weight is 45kg (7 stone) and the maximum weight is 117kg (18½ stone). The minimum height is 134cm (4ft 4). Pregnant women cannot be permitted to participate for safety reasons. Fun to be had indeed. Loved every minute of it. Will be returning again one day. Very enjoyable birthday present and fun family day out, especially for younger adults / teens. We just found it became a bit tedious due to being naturally competent on the machines and wishing they would go faster! As the ones used by the public are capped so cannot go as fast as the instructors'. Fun though but for a second experience we would look for something more thrilling and exciting than this.